On Wednesday, December 3, 2014—one day after a delegation from the Orthodox Church in America began its official visit to the Russian Orthodox Church—His Beatitude, Metropolitan Tikhon and the OCA delegation were received by His Holiness, Patriarch Kirill at the Danilov Monastery here. 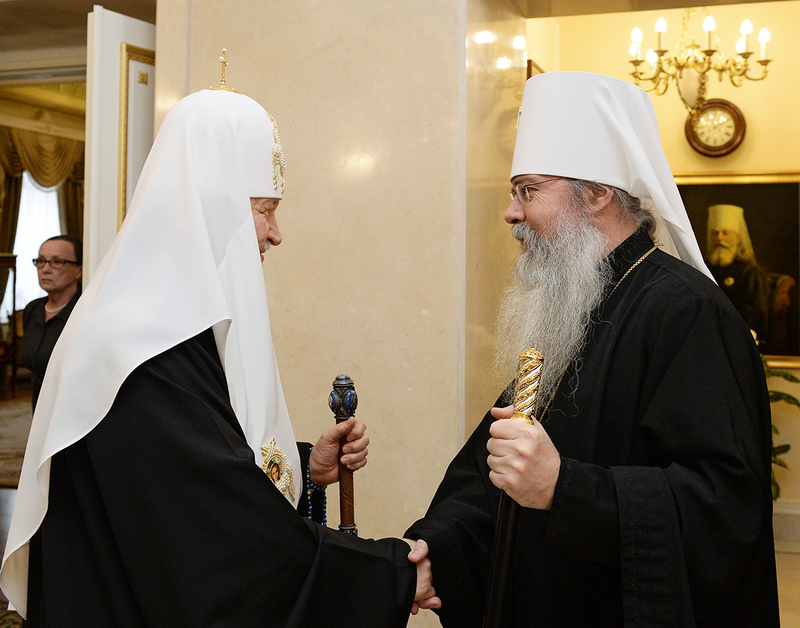 After Metropolitan Tikhon presided at the celebration of a Service of Thanksgiving in the Patriarchal Chapel, Patriarch Kirill welcomed him and the members of the OCA delegation. Metropolitan Tikhon went on to reflect on the close ties between the Church of Russia and the Church in America, recalling the latter’s remembrance of the 220th Anniversary of the arrival of the first Orthodox missionaries in Kodiak, AK in 1794. That evening, Metropolitan Tikhon and the OCA delegation visited Spaso House, where they were received by His Excellency, the Honored Ambassador John Tefft, US Ambassador to Russia. On Thursday, December 4—the Great Feast of the Entrance of the Mother of God into the Temple—Metropolitan Tikhon and the clergy members of the OCA delegation will concelebrate the Divine Liturgy with Patriarch Kirill in the Kremlin’s historic 16th century Dormition Cathedral. [A gallery of photos may be found on the OCA web site and Facebook page. I thank you for the prayers and kind words that you have offered on my behalf and on behalf of the small North American delegation that is accompanying me on my first Irenic Visit to the venerable Church of Russia. I bring to you the greetings of my brothers on the Holy Synod of Bishops and the prayers of our clergy and faithful throughout North America. 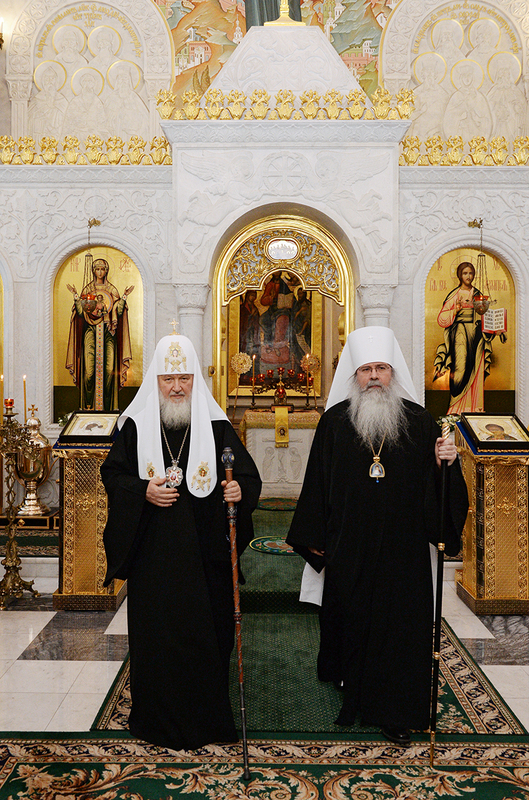 The Orthodox Church in America, the youngest among the Orthodox Churches, is always strengthened in spirit by its fraternal relations with the ancient Patriarchates and Churches that faithfully preserve the fullness of the Church and the experience of the Apostles, Martyrs and Saints throughout the ages. The Church of Russia herself has played an invaluable role in the life of the Orthodox Church in America, from the sending of the first missionary monks from Valaam in 1794 to the granting of autocephaly in 1970. The brotherly support of the Church of Russia continues in our own day and I am truly grateful for the invitation extended by Your Holiness to the Orthodox Church in America for this present visit and humbled to receive the warm hospitality which is so characteristic of Your Holiness and the Church of Russia. Our present visit is undertaken during the 700th anniversary of the great light of Russian monasticism, Saint Sergius of Radonezh. And this year, we also commemorate the 220th anniversary of the arrival of the Russian monastic missionaries to Alaska who planted the seed of the Holy Orthodox faith in the new world. Since the time of Saint Herman, the monastic labors and evangelical fervor of those holy men have allowed not only the Alaskan lands, but all of North America, to blossom into its present multicultural reality. It was this reality that provided the strong foundation for the growth of Holy Orthodoxy in North America, which now includes a multitude of Orthodox traditions, and not a small number of converts to the Faith. It is with such an attitude that the Orthodox in North America strives to be faithful to the mission and martyria of the Holy Orthodox Churches around the world, always confessing our unity with them. I am certain that our present visit will be one more opportunity for our two Churches to express our common dedication to missionary outreach, monastic labors and pastoral care for our flocks, and for us to receive Your Holiness’ great love and hospitality. Once again, I am thankful for the warm expression of love and brotherly solicitude offered by Your Holiness and by the Russian Orthodox Church. I look forward especially to our concelebration of the Divine Liturgy tomorrow for the Feast of the Entrance of the Most Holy Mother of God, and I am thankful for the honor of presiding at the Church of the Great Martyr Catherine, which is celebrating its 20th Anniversary this year as the Representation Church of the Orthodox Church in America. Likewise, I look forward to the opportunity to visit Saint Petersburg and to greet His Eminence, Metropolitan Varsonofy and those with him, as well as to visit the many holy sites and cultural centers included in the full itinerary that has been prepared for us. I experienced this same hospitality last year for the joyous events celebrating the 1025th Anniversary of the Baptism of Holy Rus’. It was a privilege to be able to serve together with Your Holiness and the most holy Patriarchs and Heads of Delegations of the Orthodox Churches throughout the world for this glorious celebration, and as a testimony to the unity of world Orthodoxy. Although there are occasional obstacles to this unity, it is my conviction that, by the grace of our Lord Jesus Christ, the Source of our unity, we will continue to collaborate together and strengthen the bond of brotherly love among the Churches in our complex global context. The Orthodox Church in America, from the time of the granting of its Autocephaly by the Church of Russia, has labored to minister to people of all these ethnic and cultural traditions, including native Americans and those who have no connection with any tradition in particular. We are thankful for the brotherly prayers and support of the Russian Orthodox Church, which has always defended our existence, sometimes straining her good relations with other Orthodox Churches. I would like to express my deep appreciation and thanks to His Excellency, the honored Ambassador John Tefft and his wife Mariella, for the hospitality they have provided to our humble delegation from the Orthodox Church in America and to all the honored guests who have gathered this evening. I am thankful to His Holiness, Patriarch Kirill for his invitation to make my first official visit, as the Head of the Orthodox Church in America, to the Orthodox Church of Russia. I am pleased that the conclusion of our delegation’s first full day of pilgrimage is taking place here at Spaso House. It is a great blessing to be with you, and we are overjoyed to share your company. I was pleased to be in Russia, Ukraine and Belarus last year to participate in the celebrations of the 1025th Anniversary of the Baptism of Rus’. In contrast to this great span of time, the Orthodox Church in America is merely celebrating the 220th Anniversary of the arrival of the Monks and Missionaries who brought the Orthodox Faith to Alaska in 1794. In this light, I would wholeheartedly agree with Ambassador Tefft’s words concerning the importance of personal contact and regular exchanges between people and institutions, especially in our increasingly global world. In our own small way, we can contribute to the greater goal of peace and mercy as we gather this evening in Spaso House by the invitation of our generous host. Let us take advantage of this opportunity to share with one another, to speak with one another and to share the ways in which we might understand one another better and, in the end, learn to love one another, as the Lord teaches us. Thank you for your prayers, and thank you again, Ambassador Tefft, for making this evening possible. I would like to present His Excellency and his wife with this print of an Alaskan Church, similar to the one he visited in Nome, but distinct by its inclusion of native “spirit houses,” a local Aleut pagan custom that was “baptized and transfigured” by the Orthodox natives into an indigenous expression of our universal faith. This entry was posted in Featured News, News and tagged Metropolitan Tikhon, OCA, Patriarch Kirill, Primate Metropolitan, US by Orthodoxy Cognate PAGE. Bookmark the permalink.